In this story you will get to see and hear about the new mobile science lab that travels through central Minnesota. Bruce Jacobson shares some information about the "Science Express" and how it positively impacts students around the area. He also discusses some of the groups that helped donate to the project, most notably Medtronic as they donated the mobile unit. ROCORI students had the chance to use this fantastic learning tool first-hand. They are just a small number of kids that will be using the "Science Express" this year. When the tour wraps up, over 8,000 students will get the chance to learn more about science and potential scientific careers. I promise that the secular version of evolution you have rejected is not the version of evolution presented in these pages. Indeed, if the understanding of our collective past and the vision of our common destiny outlined here do not inspire you to be more faithful in all your relationships, to find new ways to bless others and the world, and to awaken eagerly each morning to a life filled with meaning and purpose, then please continue to reject evolution! I promise that this book will provide you with an experience of science, and evolution specifically, that will fire your imagination, touch your heart, and lead you to a place of deep gratitude, awe, and reverence. You will also find here effective ways to talk about evolution to any friends, family, co-workers, and neighbors who are biblical literalists or young-earth creationists. 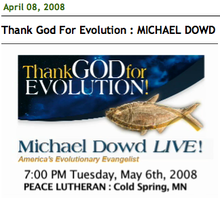 Whether you are Roman Catholic, Orthodox, Protestant, Evangelical, Anabaptist, or New Thought, and whether you consider yourself conservative, moderate, or liberal, my promise to you is that the God-glorifying evolutionary perspective offered here will enrich your faith and inspire you in ways that believers in the past could only dream of. I promise that it will be easy to apply most of what you find here to your own life and faith. I also promise that if you explore the meaning of your tradition’s insights within an evolutionary context, as I attempt to do with Christian doctrine, you will provide an invaluable service to your religion and our world. I promise that you will find nothing here that you cannot wholeheartedly embrace as being grounded in a rationally sound, mainstream scientific understanding of the Universe. I also promise that the vision of “evolutionary spirituality” presented here will benefit you and your loved ones without your needing to believe in anything otherworldly. I promise that this perspective will enrich your appreciation of the traditions and practices that nourish you most deeply, while helping you find new excitement in each. It will also help you communicate and relate to others who hold very different religious or philosophical worldviews. I promise that this holy evolutionary understanding will not only help you make sense of the world; it will also provide a rock-solid moral and ethical foundation for a life of passion and deep meaning in the midst of inevitable difficulties. I promise that sharing this book will make a difference in your relationship. Discussing Thank God for Evolution! with those you deeply care about will open new doors of possibility between you and provide common ground where none existed before. This book is a perfect gift, not to convert others to your way of thinking but to converse with them deeply and heartfully about those things that matter most. Michael Dowd LIVE! 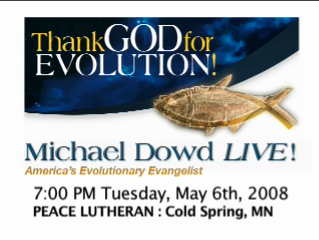 – Tuesday, May 6, @ 7 pm at Peace Lutheran Church, Cold Spring. 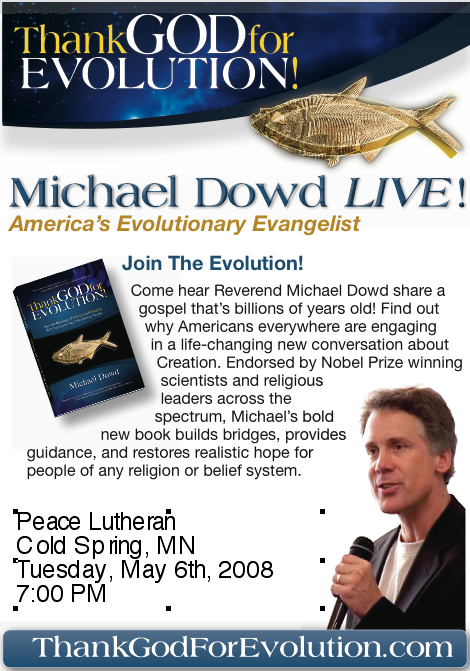 Come here Reverend Michael Dowd share a gospel that’s billions of years old and find out why Americans everywhere are engaging in a life-changing new conversation about Creation. See for yourself why Nobel Prize winning scientists and religious leaders across the spectrum are lining up to praise his bold new book that builds bridges, provides guidance, and restores realistic hope for people of any religion or belief system. Questions? Contact Brad Matuska (685-5450) or Duane Kuss (685-8603). 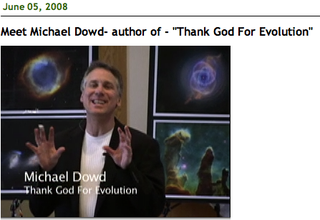 Nobel Laureates Endorse Thank God for Evolution! 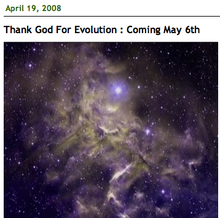 "The science vs. religion debate is over! 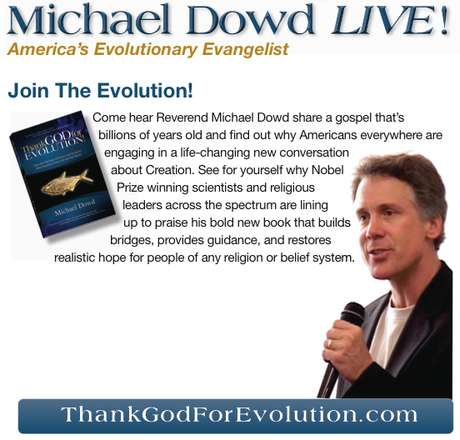 Michael Dowd masterfully unites rationality and spirituality in a world view that celebrates the mysteries of existence and inspires each human being to achieve a higher purpose in life. A must read for all, including scientists." Download the PDF Version of Michael's book FREE!